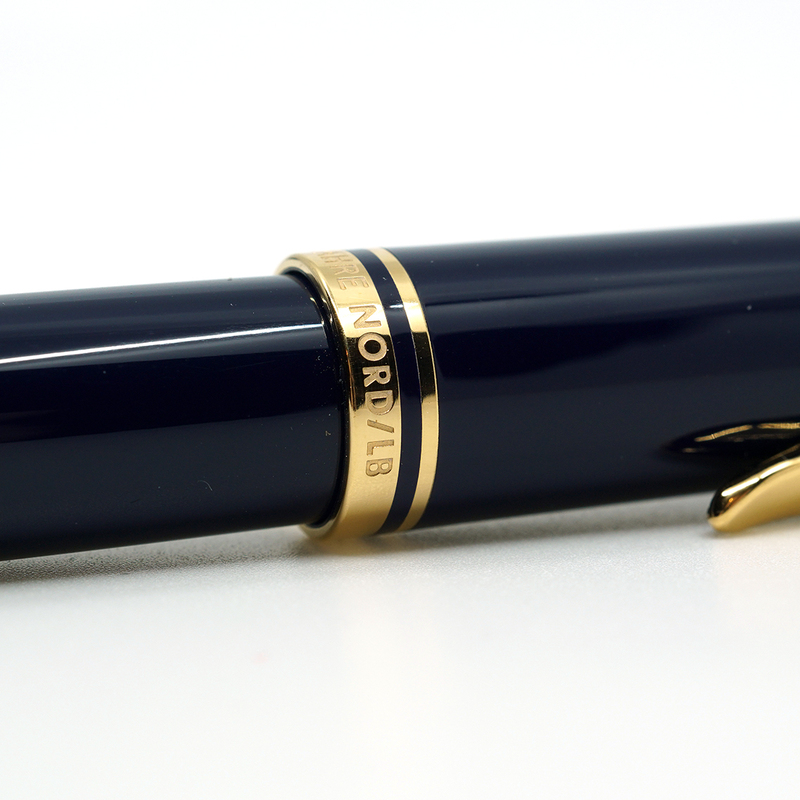 The Nord/LB M800 Limited Edition fountain pen was done in a solid dark blue color to emulate the company’s color scheme. This particular shade of blue is quite dark and could easily be mistaken for black in poor lighting. 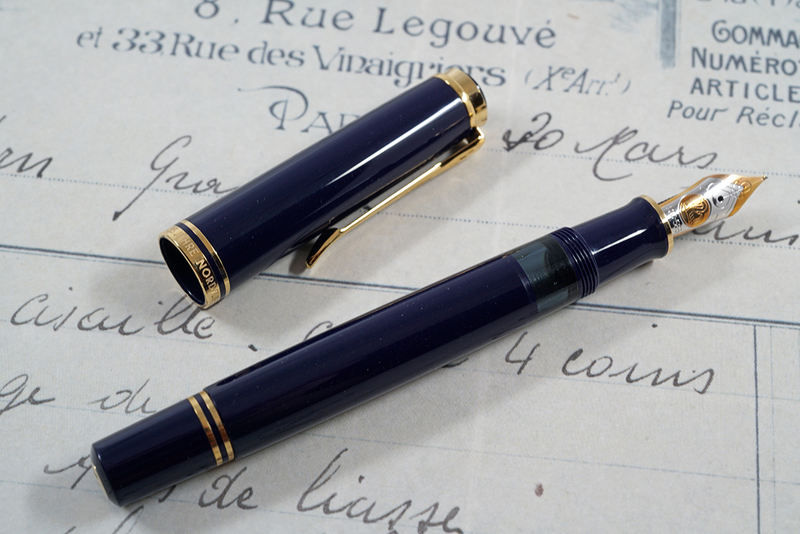 It is perhaps one of the darkest blues to grace an M8xx pen. 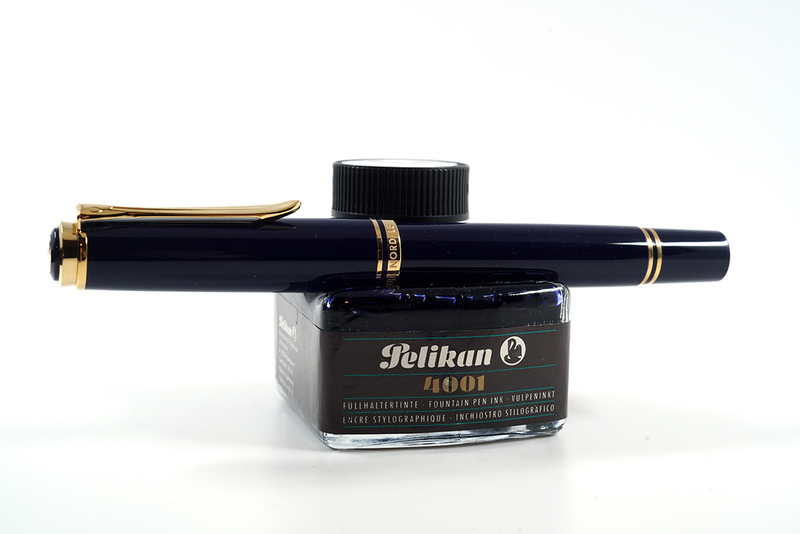 This model exemplifies the pre-1997 styling which included gold colored medallions on both the cap top and piston knob, the former sporting Pelikan’s two chick logo which was in use at the time. The remainder of the trim is not too dissimilar from what we have today and is characterized by two cap bands, two trim rings at the piston knob, and a single trim ring on the section. 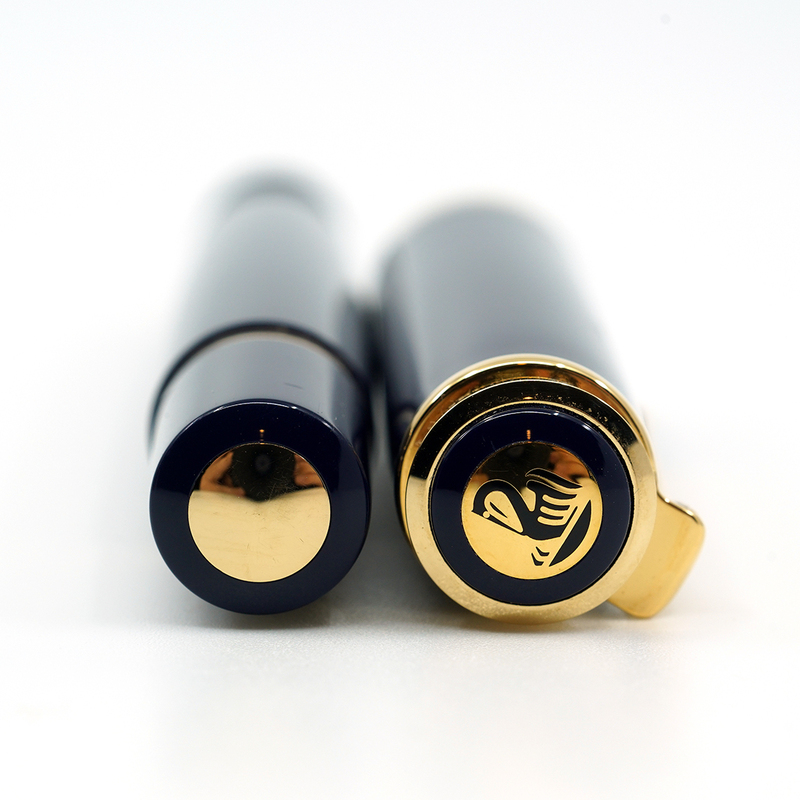 The standard pelican beak clip is present and all of the furniture is gold-plated. The cap band of this limited edition is engraved “25 Jahre Nord LB – Germany -” or “25 Jahre Nord LB/LBS – Germany -.” The German word “Jahre” means “Years.” The nib for this model was a two toned 14C-585 gold originally in a medium width. It is reported that a total of 6,920 pens were produced, one for each member of the company at the time of their 25th anniversary. 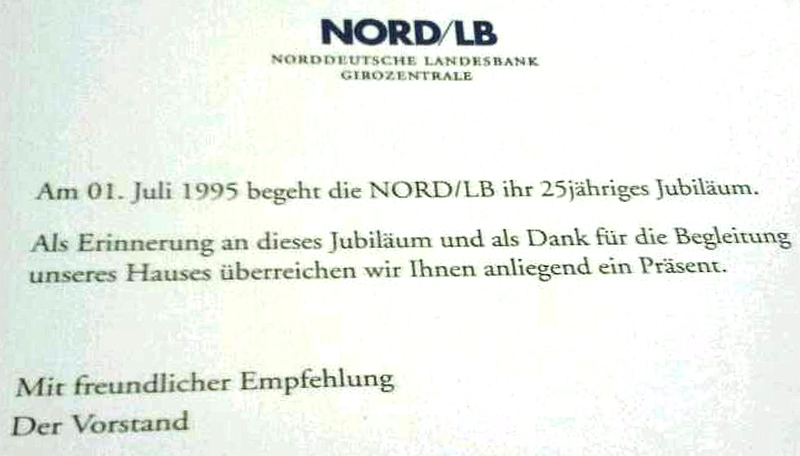 Of that lot, 5,920 pieces were inscribed ‘Nord/LB’ on the cap band (see the first photo of this post) with the remaining 1,000 carrying the inscription ‘Nord LB/LBS,’ the latter destined for employees of Landesbausparkasse, a division responsible for real estate financing. 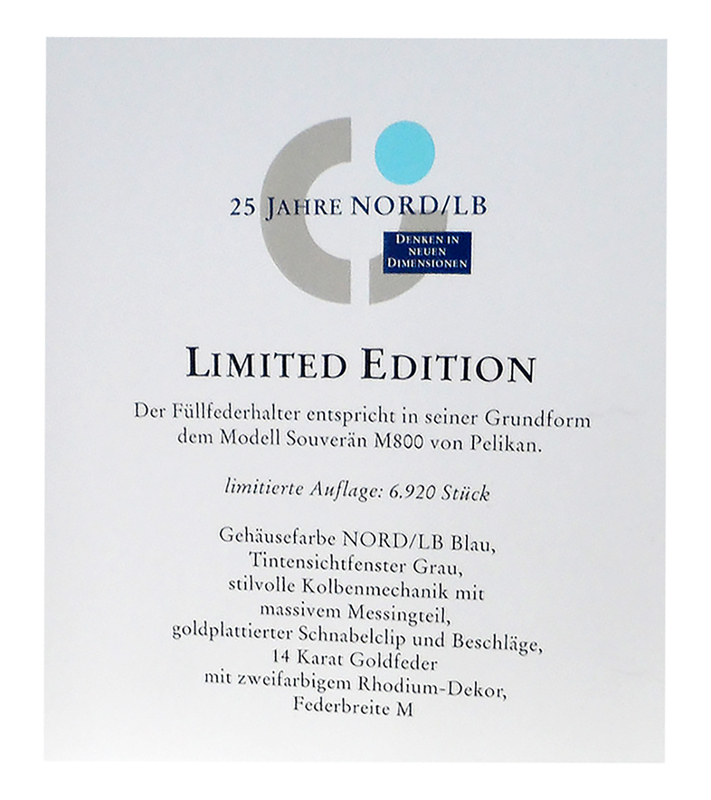 Interestingly, there is a discrepancy found in the second edition of Pelikan Schreibgeräte which relates that it was 5,500 pens made for Nord/LB and 1,450 for Nord LB/LBS, figures that stand contrary to other reporting and do not quite add up to what Norddeutsche Landesbank themselves reported. 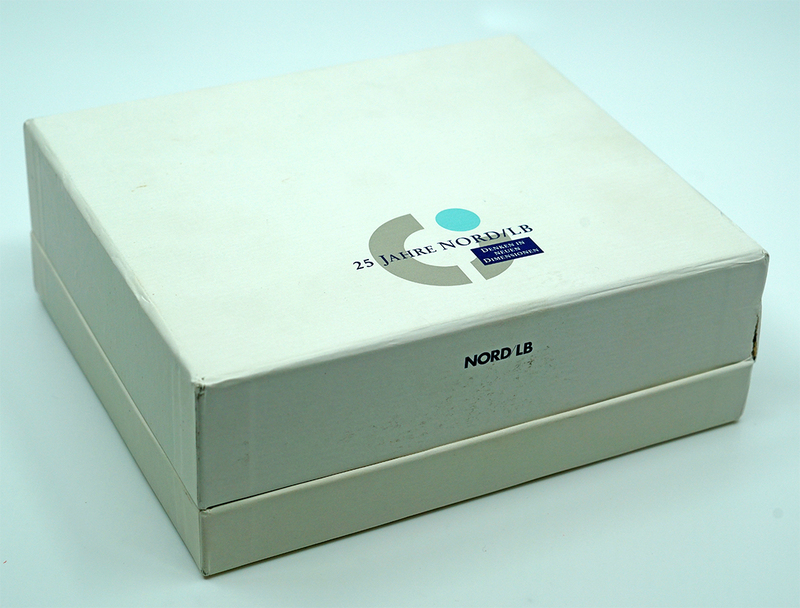 The Nord/LB M800 came packaged in a special gift box which included the pen and a bottle of ink. The box itself was rather small (measuring 6 inches in its largest dimension) and square with a hinge on the back side. 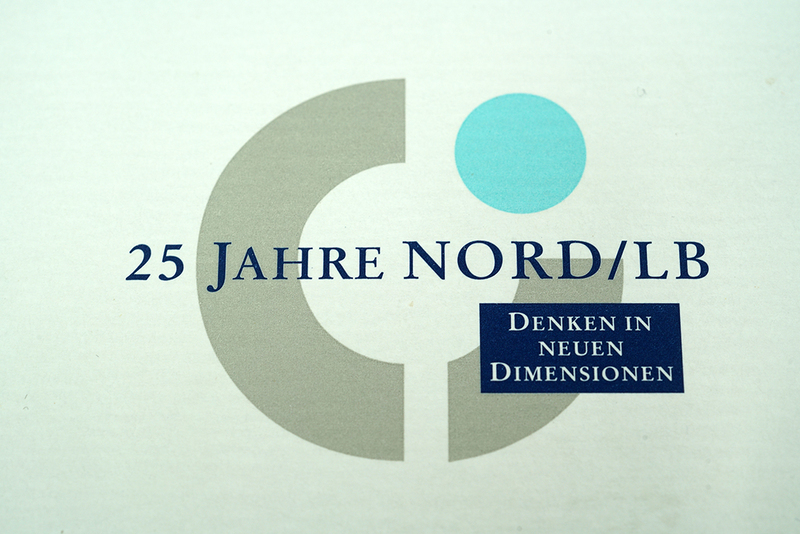 It was all white with “25 JAHRE NORD/LB – DENKEN IN NEUEN DIMENSIONEN” written on the top which roughly translates to “25 years Nord/LB – Think in new dimensions.” Nord/LB is also found written more simply on the front of the box. The packaging is otherwise without additional markings. 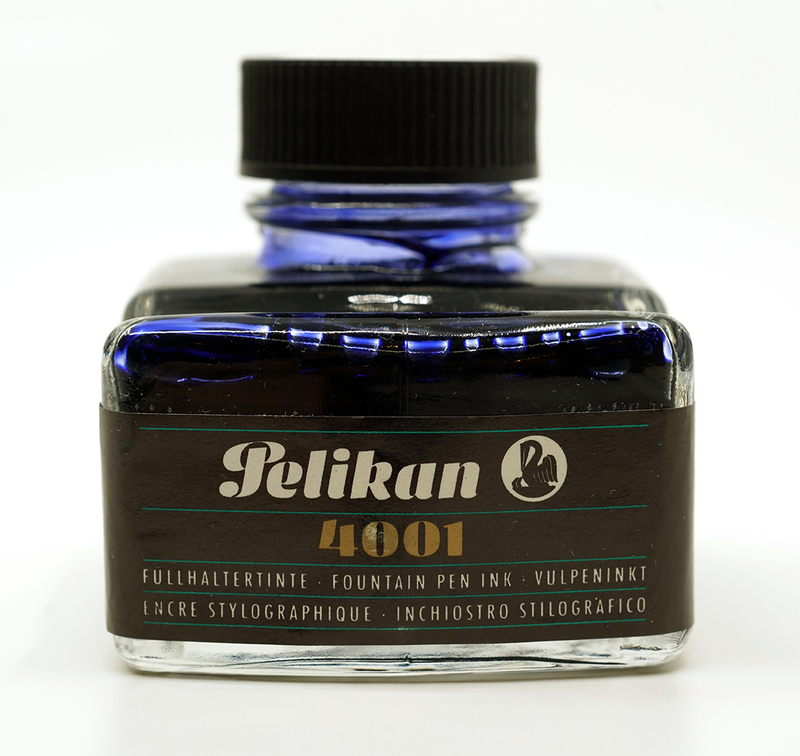 When opened, there is a place for the pen to rest and a 5omL bottle of Pelikan’s 4001 Royal Blue ink, the type of bottle which included a built-in pen stand. 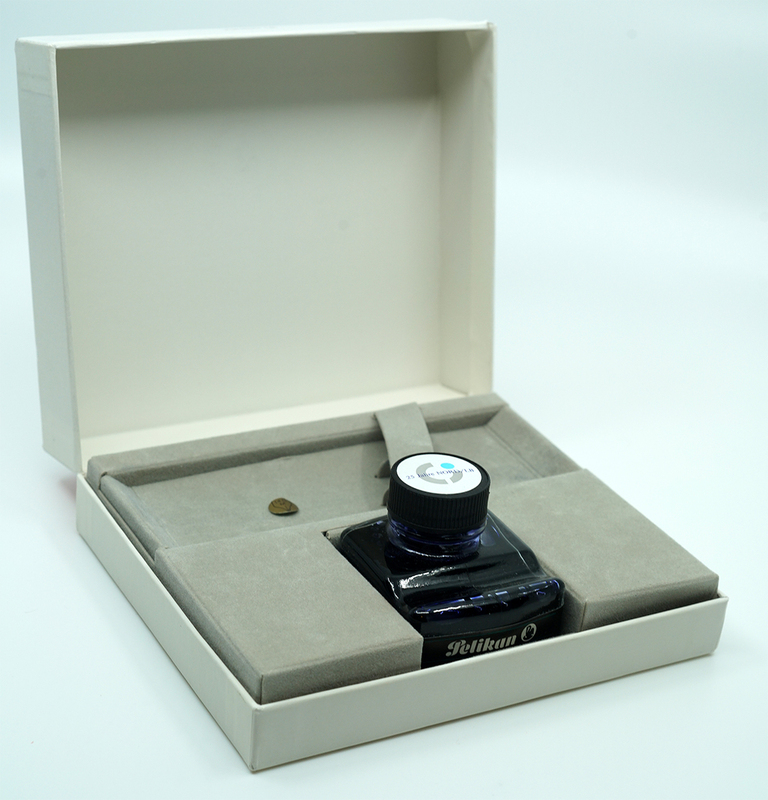 The cap of the ink bottle had a special sticker that again reflected the branding on the box. It has been suggested that many of the boxes may have been destroyed making boxed pens harder to find. I hope that this has helped to shed some light on this less well known limited edition from several decades ago. 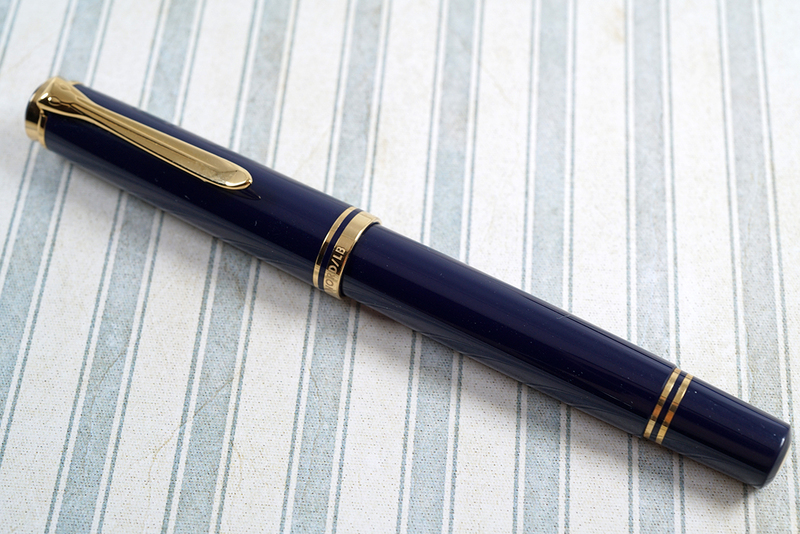 If you like dark blue pens, the Nord/LB is certainly one to go after. It’s dark color is nicely complimented by the gold trim including the two gold colored medallions. 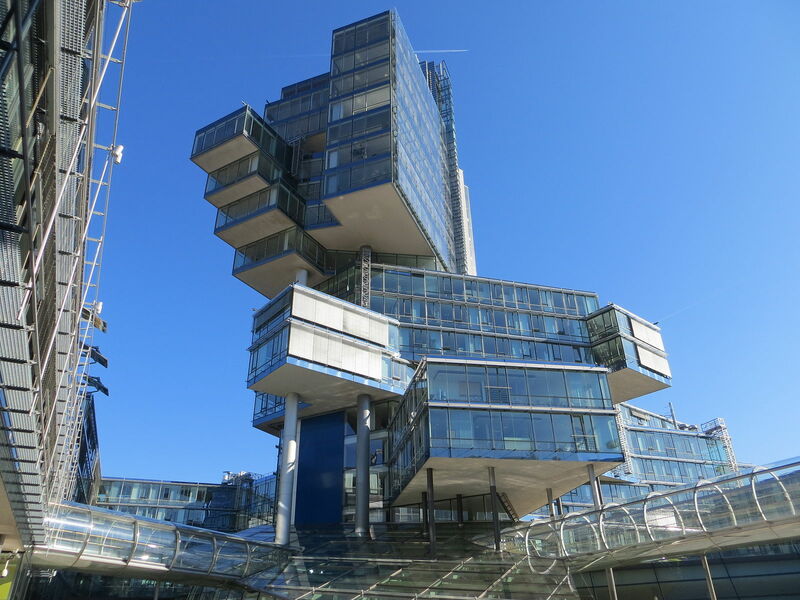 It is a very nice bland pen, however, I like the really like the architecture of the administration building of Nord/LB in Hannover, Germany. Why not pay homage to the design of the building. Opportunity missed. Don’t be too hard on them Francis. 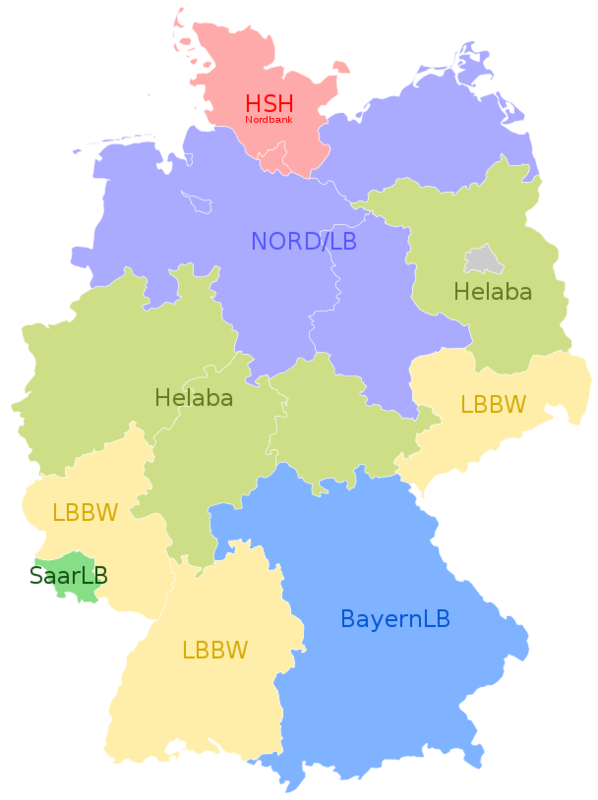 Nord/LB didn’t inaugurate it’s new headquarters until June 2002. The pen pre-dated that building by a good 8 years. Perhaps an idea for the company’s 50th anniversary coming up in 2020. Very nice pen. 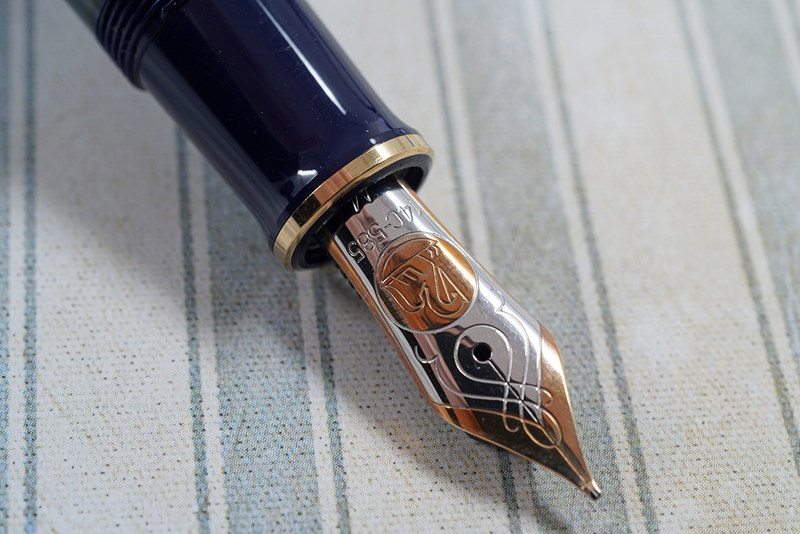 Is there a way to get a replica piece of that pen? Not that I’m aware of. The LB or LB/LBS come up for sale from time to time but they aren’t usually cheap when found. we should initiate a petition to market this stylus 🙂 Lovely! Hi Joshua. Terrific write-up, as usual. 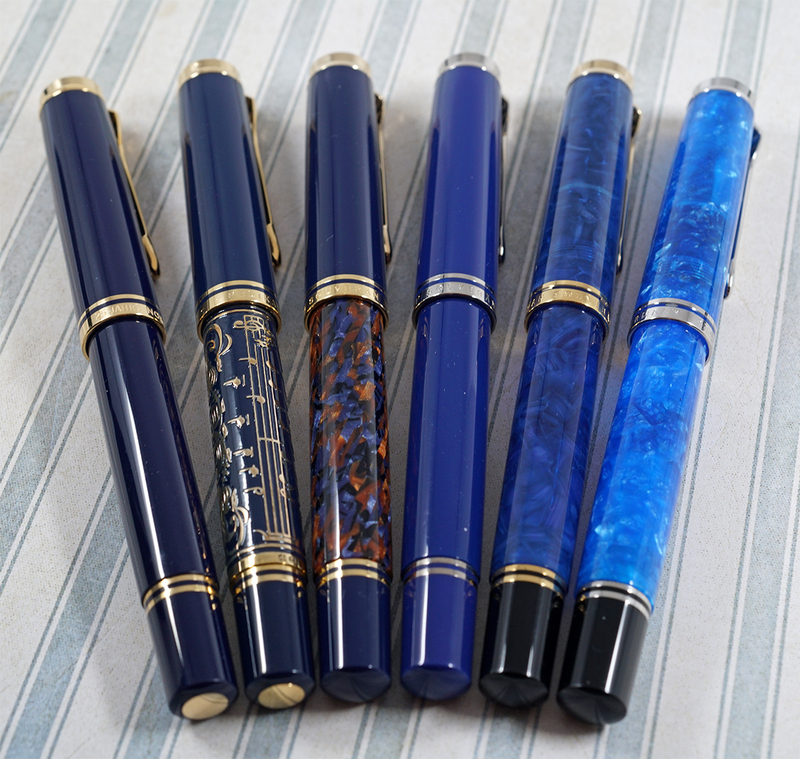 I’ve been looking for a Nord for a long time to complete my collection of blue Pelikans. Do you know if the LBS packaging was the same as for the LB? I’ve not been able to find a photo of it anywhere and was curious. Thanks Randy. I believe that the LBS packaging was the same as the LB version. I saw it once years ago and that’s my recollection but I cannot be 100% sure. It’s a great pen but not the easiest to come by.